1. Preheat oven to 120•c and line a baking tray with greaseproof paper. Get a large mixing bowl ready. Make sure it is spotlessly clean, by wiping bowl with a little vinegar to remove any residue. 2. Prepare cherry drizzle swirl by gently heating cherry conserve and maple syrup in a small pan until runny. Take off the heat and allow to cool. Pour cherry drizzle into a small cup and save the pan for cranberry syrup. 3. To the same pan, add 1/2 cup cranberries and 1/2 cup pomegranate arils. Simmer gently for 10 minutes, or until the cranberries start to burst. Taste and add a little maple syrup if needed. Use a potato masher to squash everything together, then strain into a small jug. 4. Add drained water from the can of chickpeas to the clean mixing bowl. Pop chickpeas in the fridge to use for another dish. Beat chickpea water on a slow speed with an electric whisk until bubbly. Increase the speed and whip for about 5 minutes, until soft peaks form. 5. Add in icing sugar a tablespoon at a time. Once incorporated, add cream of tartar. Keep beating for about another 4/5 minutes, until the meringue is glossy with stiff peaks. 6. Use a side plate to draw a circle with pencil on your greaseproof paper. Spoon 3/4 of the meringue in heaping tbsp dollops of meringue around the circle to form a wreath. Save your leftover meringue mix in the fridge for the vanilla cream. 7. Spoon over some of the cherry drizzle and swirl around with a toothpick to incorporate. Save the rest in the pan for making the cranberry pomegranate sauce. 8. Turn the oven down to 100•c and bake in preheated oven for 2 hours 45 minutes. Switch off the oven and leave overnight to dry out. Try to avoid opening the oven door. 9. To assemble, re whip your leftover meringue mix with a tsp vanilla powder to make vanilla cream. 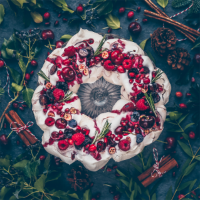 Top wreath with dollops of cream, berries and grapes followed by cranberry syrup. Decorate with a few rosemary sprigs. Serve immediately.